100 Women in Gold, Inc. presents its 6th Annual Scholarship and Awards Reception for FVSU Women Athletics, Saturday, August 29, 2015 at 5:00 p.m. in the C.W. Pettigrew Center at Fort Valley State University. 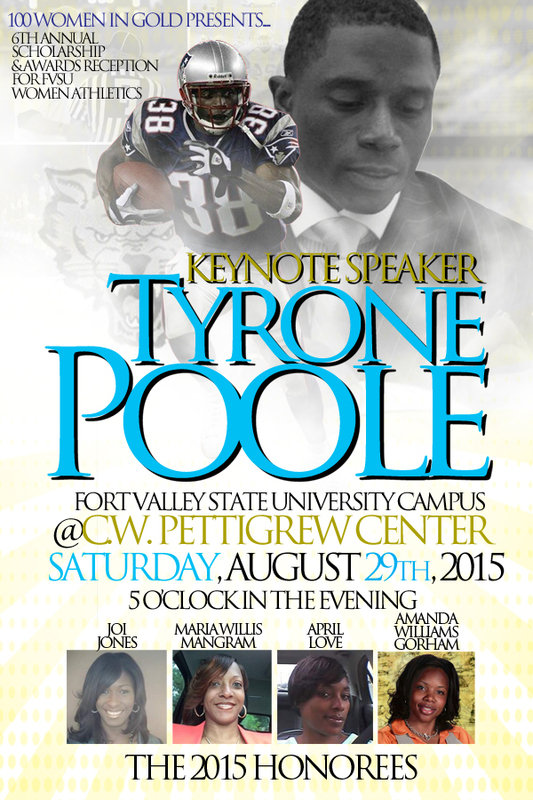 The keynote speaker will be Tyrone Poole - Speaker, Author, Inventor, Trainer. This event is free to the public but seating is limited. Tyrone Poole is a retired American professional football player who played 14 seasons as a cornerback in the National Football League. He was drafted by the Carolina Panthers 22nd overall of the 1995 NFL Draft. He earned Super Bowl rings with the Patriots in Super Bowl XXXVIII (38) and XXXIX (39). He played his college football at Fort Valley State. He was a four-year starter and became the first player from that school to ever be selected in the first round of the NFL draft. Also, he is one of two athletes in Fort Valley State University history to obtain All-American status in two sports (Football, and Track and Field). Poole is the author of "Ultimate Success In The Game Of Life" and the inventor of the "T38 Multi-Training Sled". Also, he is the CEO of The Tyrone Poole 38 Foundation, a non-profit foundation which assists under-privileged youth with funds for college (click here for flyer).